I attended a very useful workshop in Leeds on the 12th and 13th March in Leeds on Institutional Data Management Policies and Roadmaps. This follows the agreement by RCUK on common principles on data policy (e.g. data is in the public interest, a public good, with as few restrictions on it as possible), similar moves by other funders such as the Wellcome Trust, and EPSRC’s expectations on how how Research Organisations (ROs) should respond to these data principles. EPSRC expects that all ROs which they fund should have a clear roadmap to align their policies and processes with EPSRC’s expectations by 1st May 2012, and to be fully compliant with these expectations by 1st May 2015. A clear message from the meeting – where C4D can play a role – is that research organisations should use appropriately structured metadata within their data centres, and that the metadata should allow others to understand the nature of the data, how it was collected, who funded collection, how it will be preserved and how it can be accessed. The efforts that C4D are making to use CERIF to provide a cross-walk between a number of discovery metadata standards caused significant interest at the meeting. 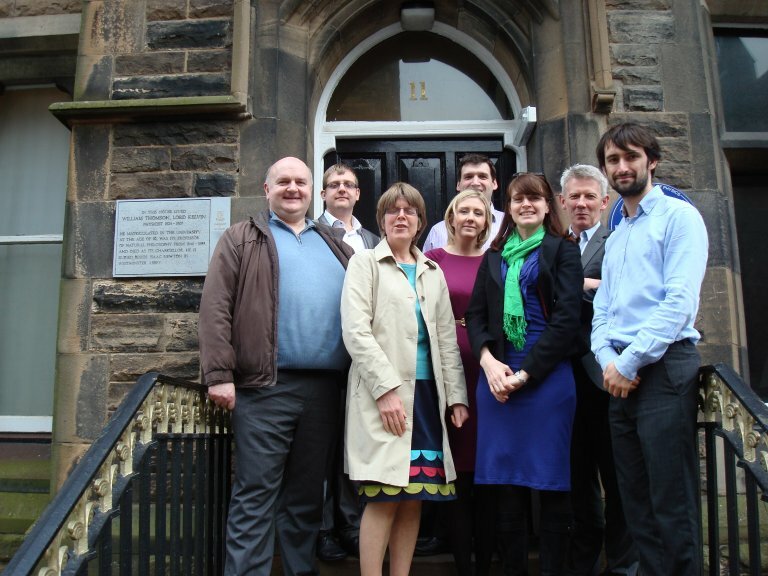 The C4D project held its first quarterly project meeting (after the kick-off) at the University of Glasgow on 29th February 2012. The meeting was a joint consortium meeting with the IRIOS-2 project. We posed on the steps outside at lunchtime for a group photo.